We can’t explain why that second cousin can’t be seated next to that roommate from college, but we can make it easier for you (and your clients) to assign (and reassign) a place for everyone at the wedding. 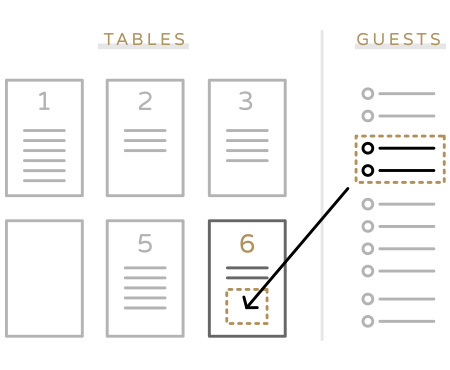 Simple Seating enables your clients to navigate table lists quickly and make changes instantly so you can keep the planning process moving forward. Replacing table numbers with the name of your couple’s favorite travel destinations, books, or jazz artists? Click the table number to edit table names, and use the plus/minus sign at the bottom of each table list to add or remove seats as needed. confirmed guests (as well as those handful of guests you might still be waiting to hear back from) into your seating list, and organize each guest by group, to help make it easier to settle on who sits where. We’ll also call out special guests, including the bride and groom, bridal party and immediate family members to make seating assignments easier to navigate. Drag and drop each guest to the appropriate table list, and drag and drop guests within a list to change their seating order at each table. How simple is that? It’s always helpful to know which tables require highchairs, and if there are any guests in a wheelchair that won’t require a chair set at their place setting, so we’ve included relevant information for easy reference. Our newly updated guest list downloads now include table assignments, and our new Seating List download includes the guest list by table, meal counts and any special considerations.